Some of you may recall that at Fluxible 2016 we had a couple of terrific musical interludes featuring an unusual instrument, the hurdy-gurdy. Those performances were by musician, composer, and musical innovator Ben Grossman. In subsequent conversations, Ben’s thoughtful insights and observations got us thinking that we’d love to have Ben share his ideas with the rest of our Fluxible community. Happily, Ben agreed, and he’s speaking at Fluxible Conference this September. Ben is a busy musician and sound artist: improviser, studio musician, composer, and noisemaker. He works in many fields, having played on over 100 CDs, soundtracks for film and television, sound design for theatre, installations, work designed for radio transmission, and live performances spanning early medieval music to experimental electronica. 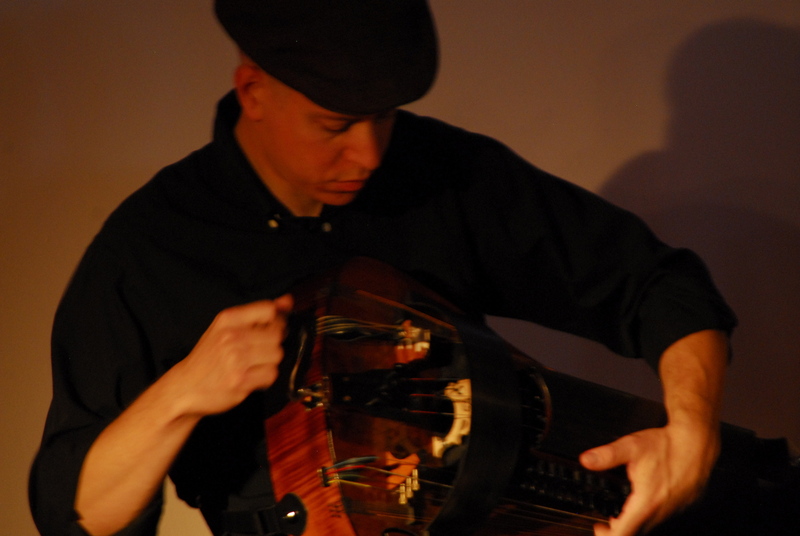 Ben’s tools of choice are electronics, percussion, and, especially, the hurdy-gurdy (vielle à roue), a contemporary electro-acoustic string instrument with roots in the European middle ages. Through extended techniques, live-looping and processing, Ben seeks to use it as a physical interface into improvised sound creation, spontaneous composition and the exploration of acoustics, form and extended aesthetics. In 1997 Ben studied Turkish music (ud and percussion) in Istanbul and has done vielle workshops and lessons with Valentin Clastrier, Matthias Loibner, Maxou Heintzen and Simon Wascher as well as working on Deep Listening and improvisation with Anne Bourne. With an abiding interest in pushing the limits of his instruments and pushing the boundaries of whatever venue or medium in which he works, Ben’s only solo CD, Macrophone was released in 2007 and features a unique two disc form for simultaneous, aleatoric playback. Stay tuned for details of Ben’s Fluxible presentation. Meanwhile, enjoy his tweets as @ben_grossman on Twitter.